Revolutionary War hero Israel Putnam is honored with an equestrian monument at his burial site on Canterbury Road (Route 169) in Brooklyn, CT. The monument was dedicated in 1888 to honor Putnam, a Massachusetts native who served with distinction during the French and Indian War and who later abandoned his plow in the field to join the Continental Army when the American Revolution began. Putnam is depicted directing troops on horseback. His horse faces east, and Putnam is looking toward the north. 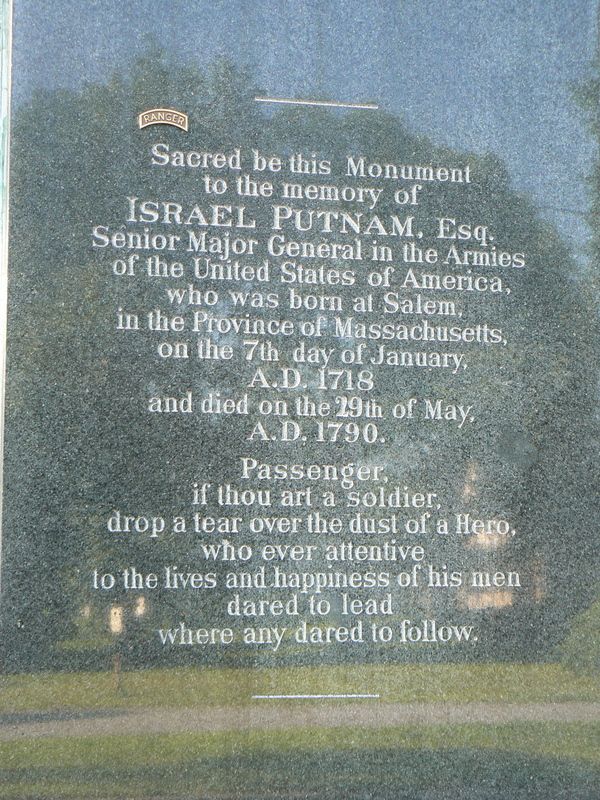 Large granite slabs on the north and south faces bear biographical and inspirational messages that were inscribed on Putnam’s original headstone. The wolves on the east and west faces refer to an incident in which Putnam ventured into a cave to kill a wolf that was helping herself to local farmer’ sheep. Upon his death in 1790, Putnam was buried in an aboveground tomb in Brooklyn’s South Cemetery. Over the years, souvenir hunters had removed fragments of the headstone and the overall condition of the tomb was deemed unsuitable for General Putnam. The vintage postcard appearing below was postmarked in 1907. The yellow building next to the monument has since been replaced by a Post Office. North of the monument, a plaque on a boulder marks the site of Putnam’s Brooklyn farm and tavern. Putnam commanded Continental forces during the Battle of Bunker Hill in 1775, and may have issued the famous command not to fire until troops saw the white of the British soldiers’ eyes. Putnam was forced to retreat from New York during the 1776 Battle of Long Island. Putnam’s military career was ended by a stroke in 1779, while the general and the Connecticut militia was in winter camp in Redding. The encampment site is now Putnam State Park. Putnam was also honored with statues in the state park and Hartford’s Bushnell Park. The town of Putnam, just north of Brooklyn, was named after him, as were eight counties.